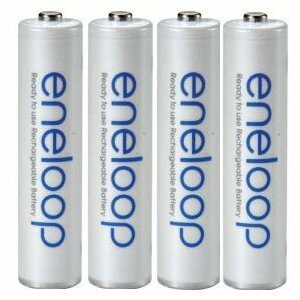 SANYO’s next-generation AAA nickel metal hydride battery ‘eneloop’. Batteries have a property to release the stored energy in small amounts (this phenomenon is called ‘self-discharge’). This property is particularly noticeable in rechargeable batteries such as Nickel Metal Hydride Batteries etc. as compared to dry cell batteries hence disabling rechargeable batteries from becoming batteries that ‘customers can use immediately after purchase’. For this reason, rechargeable batteries couldn’t be used unless charged after purchase and so lagged behind dry cells in convenience. This new product’s main property is that it has introduced great improvements in self-discharge properties (residual ratio after one year of non use is 85%*4, in temperature conditions of 20 degree Celsius according to SANYO research). Through this breakthrough development, SANYO has realized a rechargeable battery that can challenge dry cell batteries in user-friendliness through features such as making possible use immediately after purchase or once charged, its ability to be used anytime. SANYO has been a market leader in nickel metal hydride batteries for the consumer market. The synergy of the following proprietary technologies of SANYO in developing high capacity products has made the successful development of ‘eneloop’ possible : 1. high-performance negative electrode ‘superlattice alloy’ 2. make-up of battery material and battery plates 3. maintain quality despite being out of use for a long time These are a few of the technologies that have helped contain self-discharge during the period for which the battery is not in use. Furthermore, it also inhibits voltage reduction even after a long period of being out of use.